MIR Appraisal Services currently is housing a group of twelve Chinese miniatures on pith paper, which are continuously being researched. These works are interesting not only because of the materials used to create them but also because they are specific to a period in Chinese history. Pith paper is made from the rice paper plant, a shrub that is native to southern China. The pith, soft fibrous material found on the inside of the plant, is removed by pushing a circular dowel through harvested branches. It is then dried and cut into thin slices using a very sharp knife. Due to the nature of the material, sheets of pith paper are not large, generally around 5 inches x 3 inches. The finished product is a soft sponge-like piece of paper with a velvet surface texture. It is perfect for the production of miniature paintings created using watercolors and gouache, materials that when applied to the pith seem to float on the surface while allowing the unique texture of the paper to shine through. It is the use of pith paper to create miniatures that introduced Europeans to the material. In fact, most Chinese paintings on pith paper that are on the market today, including those at MIR Appraisal Services, were made to be exported to European countries, specifically England, during the 19th century. This occurred because after the Chinese lost the Opium War in 1840 the English setup several trading posts in China. 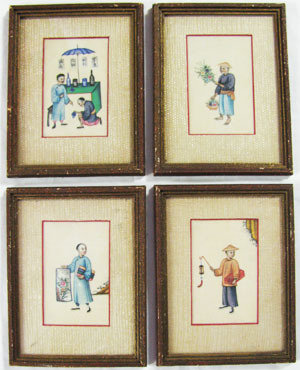 Miniature paintings on pith paper depicting everyday Chinese life were very popular among Westerners and, therefore, became a popular export for the Chinese. However, these exported miniatures were unique because they were painted in a manner Westerns were accustomed to, meaning elements often not found in traditional Chinese art appear in these miniatures, one such example being the importance of depth perception. The production and exportation of these miniatures ceased when British -Chinese trade ceased in the 20th century. The twelve miniatures that are being researched at MIR are beautiful works of art created using a very unique medium, but they also have a historical significance that can teach us something about Chinese - British involvement during the 19th century. Please continue to check this page as we continually research and update our findings on these items.